Where is Albuquerque, New Mexico? 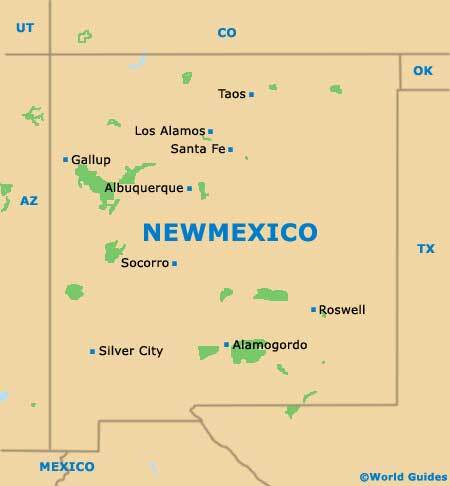 The state of NEW MEXICO is located in the four-corners region of the southwestern United States. Remember your U.S. history and geography? Need a refresher? To the east of New Mexico is Texas (and a small piece of the Oklahoma panhandle), to the west is Arizona, to the north is Colorado, and yes, the country of Mexico is to the south of us. The state capital, SANTA FE, is 55 miles north of Albuquerque, off Interstate 25. El Paso, TX, is 250 miles south, via Interstate 25. From Albuquerque to the west border is 153 miles and from Albuquerque to the east border is 206 miles. Travel east and west via Interstate 40 (in some parts this is the Old Route 66 Highway). 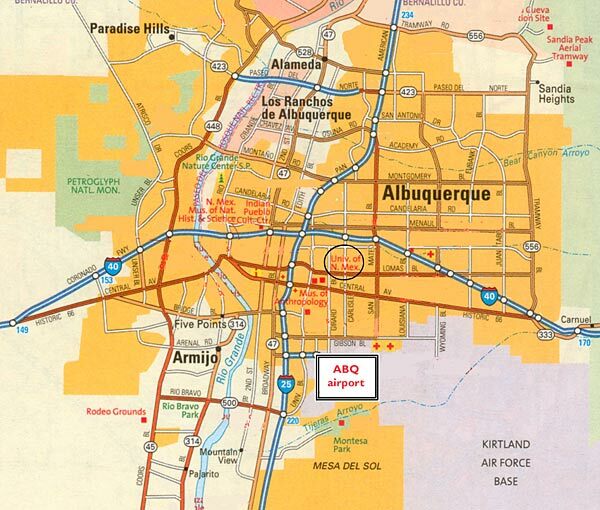 Albuquerque is almost centrally located within the state. The Rio Grande travels through New Mexico from north to south, providing Albuquerque with a greenbelt known as the Bosque bordering the river's edges. The Sandia Mountains, where trails and views abound, form Albuquerque's eastern boundary. 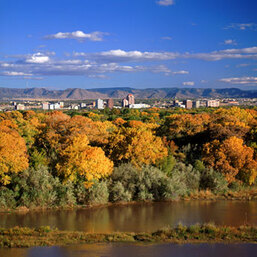 We hope to see you soon in New Mexico, THE LAND OF ENCHANTMENT. The water is award winning*, a visa isn't required, and we use American currency. We are very friendly people and there is plenty of sunshine to go around! * In 2014-2015 the Albuquerque Bernalillo County Water Utility Authority's water won the American Water Works Association (AWWA)'s best tasting water in the Rocky Mountain Section and tied for third place nationwide. Drink up -- it's critical to drink extra water at high altitude.